Emphasis is placed on the fundamentals of patient care. PL-1's strengthen their interviewing, physical diagnosis, laboratory diagnosis, oral, and written communication skills. Focus is directed toward working as a member of a healthcare team and therapeutic management of acute illnesses with the goal of being prepared to supervise at the end of the first year. Focus is directed at building skills in the diagnosis and management of complex and chronic medical problems in the inpatient and outpatient settings as well as managing chronic pediatric problems. Supervisory responsibility for care on the inpatient service begins with emphasis on teaching medical students and PL-1's. Residents also gain experience in subspecialty areas. Emphasis is placed on leadership of a health care team and autonomy as a practitioner. PL-3's supervise rotations on the inpatient unit and have responsibilities teaching residents and medical students. Adolescent Medicine, Advocacy/Child Abuse, Allergy/Immunology, Ambulatory Pediatrics, Anesthesiology, Behavioral/Developmental, Cardiology, Child Psychiatry, Dermatology, Emergency Medicine, Endocrinology, Gastroenterology, General Surgery, Genetics, Hematology/Oncology, Infectious Disease, International Medicine, Nephrology, Neurology, Newborn Medicine, Nutrition, Orthopedics, Otolaryngology, Practice Management, Public Health, Pulmonology/CF, Radiology, Research, Rural Health, Sports Medicine, and Urology. Our residents have continuity clinic one half-day per week throughout their entire residency. In clinic, they have their own panel of patients. We offer true continuity of care - many of our patients come to the SIU Pediatrics Residency Clinic from birth and stay until we set them up with an internist before college! You will have the opportunity to follow your patients throughout your 3 years here, watching them grow and develop. As their primary care physician if they need help with school, insurance companies, ordering medical equipment, etc., they will come to you for assistance. This is not only gratifying but also provides excellent hands-on experience for learning to advocate for your patients’ needs and navigate various care systems. 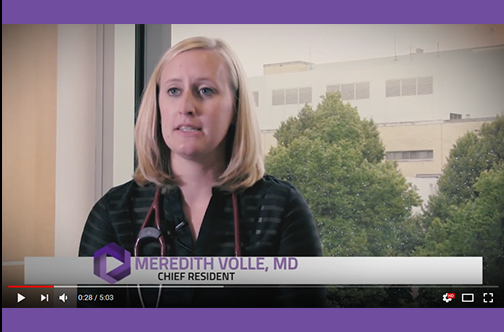 Residents are given the opportunity to see their own sick patients on days other than their scheduled continuity clinic day when their schedule permits. Residents carry between 150-250 patients each during their time here. Our patient population is very diverse and is comprised of both underserved as well as insured individuals. Residents are also able to gain experience dealing with sick call-ins during their 2nd and 3rd years. During their ambulatory months, they will be in charge of responding to sick patient calls after hours from 5pm-10pm. When scheduled as the back-up resident, they will answer phone notes from 10pm-6am. This is an excellent way to get experience in triaging sick patients and managing patient care over the phone. We are dedicated to resident education. We have a phenomenal faculty who offer on the job education as well as participating in lectures during our core lecture series. We have a variety of departmental conferences attended by residents and faculty to discuss current cases and recent pediatric literature. We look closely at clinical experiences to ensure our residents get a broad picture of the entire field of pediatrics, with all its subspecialties. We are constantly evaluating our curriculum and thinking about ways to keep it fresh, innovative and exciting. What: Grand Rounds provides an opportunity for medical students, residents, and attending physicians to gain insight to a vast array of topics in Pediatrics. Topics include common clinical problems as well as exciting new research. Presenters include Pediatric faculty members in Ambulatory Pediatrics, Pediatric Subspecialties, and visiting professors from nationally renowned institutions. Grand Rounds is attended by many members of the Springfield pediatric community including staff pediatricians, full-time faculty, medical students, house staff, nurses, and hospital administrators. The presentations are also teleconferenced to eleven other sites in Illinois. One Grand Rounds session per month is a clinicopathology conference. This is a multidisciplinary conference during which a clinical case is presented by a faculty member and resident team with contributions relevant to the case by appropriate subspecialists, pathologists, and radiologists. What: These are seminars dedicated to the "Core Curriculum" based upon educational requirements for Pediatric Resident Education by the American Board of Pediatrics, the Academic Pediatric Association, the American Academy of Pediatrics and other educational societies. Seminars are facilitated by pediatric faculty members, faculty from other relevant departments and visiting speakers. The purpose is to enhance individual study and help prepare residents for boards. Attendance is mandatory for all residents and this is considered protected educational time during which residents are excused from all clinical duties. We even occasionally take away residents’ pagers and have faculty answer pages to remind all staff that residents are not to be interrupted during this time. The Core Curriculum is scheduled as a rotating three-year curriculum so that all residents are equally prepared for boards after completing their residency. Topics are scheduled far in advance to allow plenty of time for preparation and distribution of related readings. What: Board review sessions are informal, interactive reviews held monthly with residents and one rotating faculty member. A specific reading section is assigned in advance, and upon arrival residents answer board questions related to their readings to assess their knowledge of the material. The questions are then discussed with the faculty member, who reviews key points of the material as well as test-taking tips. What: Resident Rounds is one of the most important educational activities during residency training. Residents take turns presenting on topics that they have recently seen or that are interesting to them. We utilize different formats to keep the sessions interactive and target clinical reasoning skills such as developing meaningful differentials, using appropriate diagnostic tests and managing patients following the evidence-based medicine approach. This provides a forum for house staff to develop skills in presentation, diagnostic evaluation and patient management. The presenter identifies critical points for discussion and formulates questions encouraging analytical thinking by participants. Faculty help facilitate but do not dominate the discussion. What: Journal Club is the evidence-based medicine seminar for our residents. Statistics and validity tools are explained to help residents conduct effective searches and find answers to their clinical questions in recent articles. Attended by faculty and house staff, journal club focuses on learning how to interpret data presented in journals and how to incorporate that information into their daily practice. What: This is a closed forum that includes SIU Pediatric Residents, Faculty and occasionally invited guests from other departments who were involved in a case being discussed. The goal is to provide residents with the necessary knowledge and skills so they will be able to assume responsibility for peer review, quality improvement and risk management activities in their post-residency careers. The conference is also a forum to identify and address system issues. Residents take turns presenting these cases in which they may or may not have been involved. This also provides an opportunity for residents to learn about chart review and how to appropriately document clinical thought processes. What: “Universal Issues” is a seminar series offered to residents in all disciplines at SIU by the Office of Graduate Medical Education. It is designed to assist with the transition to residency as well as on to future careers. Topics include Sleep & Fatigue education, Residents as Teachers, Stress Management, and Finding Your Dream Job, among others. Residents are excused from clinical duties to attend these workshops.